Most mild to moderate cases of acne can be treated effectively with drugstore cleansers and ointments. The strongest and most effective over the counter acne treatments contain benzoyl peroxide. 0.1 How Does Benzoyl Peroxide Work? 1.7 Glo Skin Beauty Clear Skin Spot Treatment – Acne & Pimple Spot Treatment, 0.5 fl. oz. Topical benzoyl peroxide in cream, gel, or lotion form works to both prevent and treat inflammatory acne (cysts, red pimples, and zits) and non-inflammatory (blackheads and whiteheads). It’s a very effective exfoliant – it clears pores of clogged oils and dead skin which are the root causes of blackheads and whiteheads. This exfoliation action also expedites cell turnover, which helps heal the spot. It’s anti-bacterial – by releasing oxygen, which is lethal to the p. acne bacteria. It promotes wound healing – by attracting macrophages and histiocytes (types of white blood cells that protects the body from infection) into the wound. Use a hypoallergenic, non-comedogenic moisturizer after application to counter the side effects and restore the skin’s pH. This is a very, very crucial step — after applying benzoyl peroxide, let is absorb for a few minutes and follow up with a gentle and deeply hydrating moisturizer. Moisturizing is truly not optional if you want to have clear and healthy skin. We want the benefits of benzoyl peroxide, not any of its side-effects. If you’re suffering from severe acne, its best to undergo a program that will help you get to the root of the problem and address the causes. Acclaimed programs like Mike Walden’s Acne No More and Clear Skin Unlocked can be a great start. This website is for informational purposes and is not intended to be a substitute for professional medical advice, diagnosis, or treatment. Recommendations are based on our research, results, a comprehensive analysis of the products' formulation, claims, and value for money. We make an effort to be as objective as possible and give advice in good faith; however, our reviews are 100% honest and therefore may still contain conjectures and opinions based on our personal experiences. It’s important to know that as with any product (especially cosmetics), what may be perfect for you may not be right for the next person. So as much as we want to guarantee that these will be everyone’s next holy grail, results can still be affected by individual factors like your current skin condition, the environment you’re in, use of the product, reaction to your other skincare, and so on. For best results, make sure to choose products that are suited for your skin type and skin issues. At the end of every review, there will be a link for you to check current discounts and other customer reviews on Amazon. These, along with some other links that redirect you to third-party sites, are affiliate links where we earn a small commission if you do decide to make a purchase. This is at absolutely no extra cost to you and will help in maintaining the quality of the site. Thank you for visiting and here’s to being the best version of yourself! These are our choices for the best topical treatments with benzoyl peroxide based on formulation, our experience, value for money, specifications, and consumer reviews over the years. Make sure to choose one that is most suited for your skin type and condition. One of the products from Paula’s choice that stands out based on my experience. It’s a soothing, weightless lotion that is safe for sensitive skin. It also leaves an invisible matte finish, perfect to wear under makeup and for those with oily skin. This can be used as a spot treatment and can last for well over a year if you only have occasional breakouts. If you’re using this in conjunction with their anti-acne skincare line, you can apply this as the last step of your routine, ie. after your moisturizer. All Paula’s Choice products are 100% fragrance-free, clinically proven to be non-irritating, and never tested on animals. Also available in 5% strength. This product comes with a generous 100 money back guarantee and an excellent customer service (had a problem with their shipping which they sorted immediately). It comes in gel form so it’s quickly absorbed by the skin. It also has very few ingredients which help reduce the possibility of any allergies or other irritations. This is a basic formulation; if you have normal, resistant skin and looking for simple and affordable benzoyl peroxide gel. One of the few that is used not just as a spot treatment, but all over the face. It can be used as a preventive measure for acne-prone skin. It’s step 2 of Acne.org’s famous 3-Step System. Below is a video from the developer himself on how to apply the treatment. Recommended if you have constant breakouts in large areas. This benzoyl peroxide is pharmaceutical-grade and triple milled so it penetrates the skin better than regular formulations. The gel base absorbs quickly and goes on smooth without clumping with other moisturizers. It also doesn’t turn white when you perspire. This size should last for 2-4 months on The Acne.org Regimen. Definitely value for money, especially for the long run. Pharmaceutical grade, pH balanced, fragrance-free, and dye-free. No animal testing or animal products. If 2.5% is no longer cutting it, you can step up to a higher 5% strength. This physicians-only product line holds some of the most popular and well known exfoliating skincare. Glytone is a staple in clinics worldwide because of their innovative and customized approach to formulating with the highest free acid values (i.e., unlike other brands, their acids are not compounds or diluted down). Glytone in-office treatments are usually prescribed with at-home regimens to work synergistically. This maximizes product efficacy and skin tolerability, giving you visible, long-lasting results. 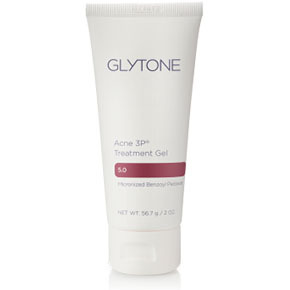 This 5% benzoyl peroxide treatment gel is part of Glytone’s Acne Clearing Set. It has a patented time-released micronized benzoyl peroxide, which means the product continually gives the skin small doses of BP over a period of time instead of one strong dose during application. This gives the medicine a more natural rhythm and makes the skin more receptive to it. This type of delivery system ensures maximum absorption while minimizing potential irritation. Its innovative hydrogel formulation hydrates the skin and fends off dryness while continually fighting acne throughout the day. Non-whitening matte finish. Non-irritating formula. Fragrance-free. Oil-free. Non-comedogenic. The spot treatment version of the PCA SKIN BPO 5% Cleanser. Instead of phytic acid, however, the exfoliant that comes with the cream is lactic acid. This is the gentlest type of AHA among all the alpha hydroxy acids and is the most moisturizing. This helps gradually slough off dead skin in the area to avoid further infections and help renew damaged skin. It also has tea tree oil in the mix, one of the most established botanicals that heal acne and promotes a clear complexion. Key Ingredients: 5% Benzoyl Peroxide – penetrates pores to eliminate existing acne lesions and prevent future breakouts; Lactic Acid – moisturizes the skin, Tea Tree Leaf Oil – promotes a clear complexion. Best for: Oily and Combination skin; looking for spot treatments, those who don’t have exfoliating products in their regimen. A non-drying, lightweight gel cream that absorbs quickly into the skin. It delivers a potent blend of benzoyl peroxide, licorice, green tea, and Epilobium Fleischeri Extract. Epilobium Fleischeri Extract is an innovative ingredient that is very effective to reduce sebum on oily skin. It also reduces inflammation and appearance of pores. Great for the T-zone and areas you need to minimize pores. Green tea and licorice have antioxidant properties to help keep your skin look and feel younger. No parabens or chemical colorants. Alp Sebum – a ground-breaking ingredient proven to decrease sebum production and aid in inflammation. It also reduces the appearance of pores and is non-comedogenic. Glo Skin Beauty Clear Skin Spot Treatment – Acne & Pimple Spot Treatment, 0.5 fl. oz. Use as a spot treatment for current breakouts and to prevent future flare-ups. It disappears into the skin and can be used under makeup. Along with a good dose of acne-fighting 5% benzoyl peroxide, it has aloe vera and rosemary to help prevent reduce inflammation and redness. These also help in the healing and repairing skin that was damaged by acne. Glycerin is added as well and works in tandem with aloe vera for added hydration. 10% is the highest strength you can go without a prescription. This is best used for large, inflamed cystic acne. Jan Marini Skin Research (JMSR) is one of the world’s leading professional skin care brands, carried by physicians worldwide. They are known for their award-winning and innovative formulas. This product is quite unique as the benzoyl peroxide in this lotion is highly micronized and combined with specialized emollients (moisturizers). This ensures maximum delivery of your 10% BP (which is also the max % you’ll be able to get OTC, so max 2x!) while minimizing its side effects of dryness and irritation. To use, cover the affected area starting every other day to 1-3x daily. 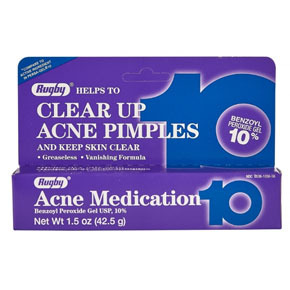 Oxy-10 was previously a prescription topical medication for acne. This is a very strong, straight up BP leave-on gel. This means that you’ll have to do due diligence in dealing with the side effects that come with using benzoyl peroxide like dryness, redness, and irritation. Good news is, you can pretty much cover this with a good hydrating and non-comedogenic moisturizer. Look for one that has extra calming and soothing ingredients. The consistency is a little thicker than the usual gel but it still dries quickly and shouldn’t slide off even in your sleep. The package comes with several tubes which should last you a very long time. 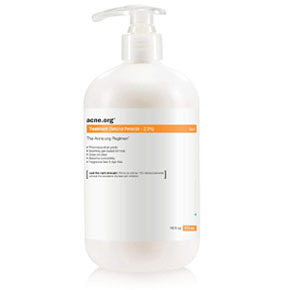 3 2.5% Benzoyl Peroxide Dr Song Acne Gel Treatment Lotion 2.5% Simple, affordable benzoyl peroxide lotion. 100-day money back guarantee. All skin types. Resistant skin. 4 Acne.org 16 oz. Treatment (2.5% Benzoyl Peroxide) 2.5% Pharmaceutical-grade & triple milled for extra penetration. Preventive acne treatment. All skin types. For overall face treatment. 5 Glytone Acne 3P Treatment Gel 5% Patented time-released micronized benzoyl peroxide. Non-whitening matte finish. All skin types especially dehydrated, oily or dry skin. 6 PCA SKIN Acne Cream 5% Lactic acid (gentle exfoliation). Tea tree oil (antibacterial). All skin types especially those prone to dry patches. 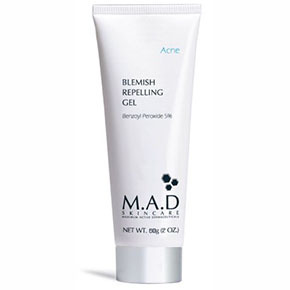 8 M.A.D Skincare Blemish Repelling Gel 5% Green tea, licorice (antioxidant). Epilobium Fleischeri extract (oil control, pore minimizing) Oily to Combination skin. 7 Glo Skin Beauty Clear Skin Spot Treatment - Acne & Pimple Spot Treatment, 0.5 fl. oz. 5% Aloe vera & Rosemary (anti-inflammatory, antioxidant). Glycerin (hydration). All skin types especially those prone to redness & inflammation. 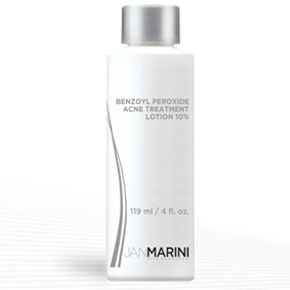 9 Jan Marini Skin Research Benzoyl Peroxide Acne Treatment Lotion 10% 10% Highly micronized BP combined with specialized emollients for maximum delivery & minimum side effects. Normal to Oily Skin. Before including this in your regimen, you need to be aware of its possible side effects. This is crucial because expecting these and knowing how to deal with it head-on is one of the keys of a successful treatment. Now for the catch-22: dry skin can clog pores and irritated skin practically guarantees breakouts in acne-prone skin. Use a hypoallergenic, non-comedogenic moisturizer after application to counter the side effects and restore the skin’s pH. Be sure to find a moisturizer that is gentle and won’t irritate your skin (opt for formulations for sensitive skin). Also, check that it is lightweight and non-comedogenic so as to not further aggravate your acne. If used in daytime, complement with a broad spectrum sunscreen. Important Notes: It’s also important to acclimatize or let your skin adjust when incorporating any new product. Your safest bet is to start with the lowest % strength, using it once every other day. Gradually increase usage to 2-3 times daily or as needed as you go on. You can work your way up in % or frequency when you feel like your skin needs and is prepared for it. If any dryness or peeling occurs, reduce the frequency or % strength. Benzoyl peroxide has been very effective for me but it is by no means a cure-all. If you’re suffering from persistent acne, its best to undergo a program that will help you get to the root of the problem and address the causes. Acclaimed programs like Mike Walden’s Acne No More and Clear Skin Unlocked can be a great start. Adapalene/benzoyl peroxide clearly superior in facial acne. (2007). Inpharma Weekly, &NA;(1617), p.14. Alvarez, O. (1983). Benzoyl peroxide and epidermal wound healing. Archives of Dermatology, 119(3), pp.222-225. Benzoyl Peroxide Topical: MedlinePlus Drug Information. (2018). Cohen, H. (1975). 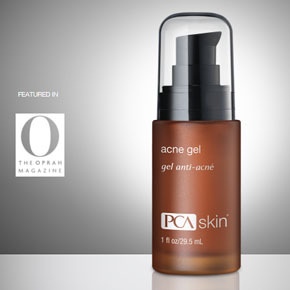 Benzoyl Peroxide Gel in Acne Treatment. Archives of Dermatology, 111(11), p.1535. Colman, G. and Roenigk, H. (1978). The Healing of Wounds in the Skin of Piglets Treated with Benzoyl Peroxide. The Journal of Dermatologic Surgery and Oncology, 4(9), pp.705-707. Del Rosso, J. and Zeichner, J. (2016). Advances in Acne Management, An Issue of Dermatologic Clinics. 1st ed. Saintt Louis: Elsevier Health Sciences. DM, F. (2018). How patients experience and manage dryness and irritation from acne treatment. – PubMed – NCBI. Evidence for the Use of a Benzoyl Peroxide Wash in Acne. (1984). InPharma, 441(1), pp.15-15. Glymed Plus. (2017). GlyMed Plus. Gloprofessional.com. (2017). 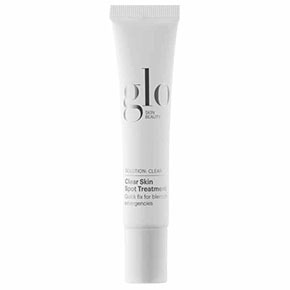 glo minerals Makeup & glo therapeutics Skincare | gloProfessional. Panoxyl.com. (2017). PanOxyl | Acne Treatment with Benzoyl Peroxide Formula. Pcaskin.com. (2017). Skin Care Products. Rugbylaboratories.com. (2018). Home | Rugby® Laboratories.